If you are shopping for a good, cheap inflatable stand up paddle board that is versatile and will last you for years, then look no further than the Tower Adventurer iSUP. This is probably one of the best iSUPs for the money because you get the board, a pump and a three-piece paddle for the price. That’s pretty much everything that you need for a good time paddling out on the water. Now that you already know that the Tower Adventurer is probably the best cheap inflatable stand up paddle board that you can buy, let me share some of the best features and things that make it such a good buy. Can I use a leash with the Tower Adventurer 9’10” Inflatable SUP? Is there a weight limit for the Tower Adventurer 9’10” Inflatable SUP? How easy is the Tower Adventurer 9’10” Inflatable SUP to deflate and will it fit into a carry-on bag? Does the Tower Adventurer 9’10” Inflatable SUP have a stabilizing fin? Can you use the Tower Adventurer 9’10” Inflatable SUP to ride waves in the surf? Does this board come with its own bag? How do I get the air pump to attach to the inflatable SUP to air it up? How much does the Tower Adventurer 9’10” Inflatable SUP weigh? Is this is a good paddle board for beginners? Versatility is the biggest strong point of this board. You can use it for some flat water paddling, surfing some waves or getting fit with a little yoga or pilates. It is also a great iSUP for kids and for taking out your dog with you. And since it is so lightweight and cheap, it’s probably the best inexpensive inflatable stand up paddle board for women too. Some of the larger boards are more difficult for smaller women to carry, which is why this one is a good choice. And since this board is inflatable, it is super easy to store and to transport since it just rolls up and fits into a carry pack. You can even travel with it on a plane if you want to. The board is six inches thick, which means that you get great stability from it as it is very durable and rigid when out in the water. Do not confuse this with some flimsy little pool raft because this is the real deal. You do not need to worry about taking this iSUP out in the water cause it is a high quality SUP. I do have two small complaints about it though. First, the paddle that comes with it does not float. For some people this isn’t a big deal, but I’m clumsy and don’t want to lose my paddle to the bottom of the lake if I drop it. Second, the included pump is only a hand pump, which means that my arm is super tired after inflating it before I even hit the water. Pro tip: replace the pump for an automatic one that you can connect to your car. Tower makes awesome water sports equipment, but even so this iSUP comes with a 2-year warranty. It covers pretty much everything other than normal wear and tear. Doesn’t matter though cause you’ll probably never have to use it cause this is a great, quality board. HIGHLY DURABLE – Military-grade PVC material and drop-stitch construction. Never worry again about dings and board cracks..
PORTABLE – Easy to store and transport. It is 9’10” x 32″ x 6″ inflated and only 1 foot in diameter and 33″ wide when rolled up..
PACKAGE DEAL – Includes board, pump, and 3-piece adjustable aluminum paddle..
As you can see, this board offers a lot at this low price point. Of course, you might have a few questions about it before you pull the trigger to buy it. Let me see if I can answer some of those questions in advance. Yes, you can. There are D-rings on the front and back of the board where you can attach a leash. Yes, the weight limit for the Tower Adventurer is 350 pounds. Give yourself around 5 minutes to get it deflated. And just one person can do it. You’ll need to roll it up lengthwise to get it as small as possible, around 30 inches, to fit in a carry pack. It will weigh too much to be able to take it on a plane as a cabin bag though, at least with most airlines. Yes, has a total of three fins, with the largest fin being removable. Yes, it performs well in the surf. 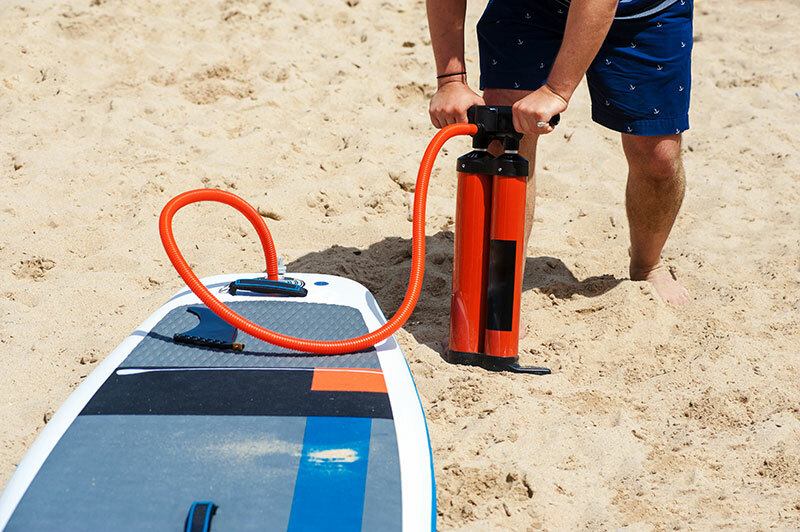 First, be sure to only use the air pump that comes with the board or you will risk over-inflating the SUP. To get it all aired up for the water, take the end of the hose on the pump and attach it to the board’s air valve by pushing down and turning the pump hose attachment clockwise. This sets the air hose to the valve on the board. After you do that, you are ready to start the pumping action to get it all aired up. It has an aluminum shaft and a plastic/nylon paddle. The Tower Adventurer is one of the best stand up paddle boards for beginners. It is also great for intermediate paddlers since it is such a versatile board. Got more questions or want to read reviews? Or, check out our list of the best 10-foot inflatable stand up paddleboards for the money.